The calendar widget is used to pick dates when setting up items in your site’s Home, Schedule, Site Setup, Announcements, Course Map, AT&S, Discussions, and Modules. To set dates in Home Page and the tools under Site Setup, click on the calendar icon. 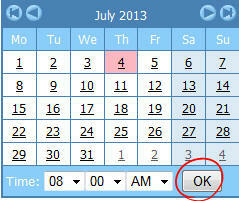 Select the date and time and click on OK.
Or to set the current date and time, click on Now. 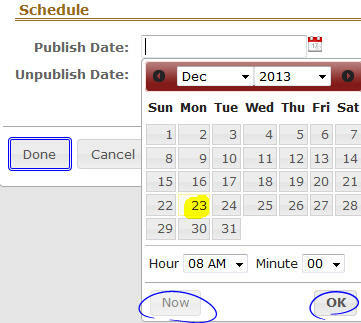 To set the dates and times in any of the aforementioned tools, click on the calendar icon next to the date fields. Alternatively, you can type in dates and times yourself, as long as you enter the format perfectly. If you don’t set a time, the calendar widget will default to 8:00am for open dates, and 11:59pm for due dates and allow until dates. Choose the time from the drop-down boxes at the bottom of the window. Note you can choose AM or PM and one minute intervals. After time is set, click on the date you want the item to open. The calendar widget in the schedule is slightly different. When creating a new schedule event, click on the little calendar to the right of the Date boxes to choose the date from a calendar. Alternatively, you can pick the date from the drop-down boxes. Simply click on the date for the event and it will be inserted into the boxes automatically. To set the times, choose your times from the drop-down boxes. You are limited to 5 minute intervals in Schedules.